See an animation of the planetary and potentially habitable zone orbits of the Capella Aab system or of the Capella CD system, with a table of basic orbital and physical characteristics. Also, take a "trip to Capella" using hypothetical images from an x-ray interferometer (created by the Center for Astrophysics and Space Astronomy at the University of Colorado). Capella Aa is a yellow-orange giant star of spectral and luminosity type G8-K0 IIIe. The star has about 2.7 times the mass of Sol, 12.2 times its diameter, and around 78.5 times its luminosity (Hummel et al, 1994; and Mewe et al, 2001; in pdf). According to the Yale Bright Star Catalogue, 1991 5th Revised Edition notes entry for HR 1708, Magnesium-II emissions were detected by balloon-borne spectrometer and soft X-ray emission was also detected. It may be around 525 million years old (Hummel et al, 1994). Star Aa is a RS CVn type variable, a New Suspected Variable star designated as NSV 1897. Useful catalogue numbers and designations for the star include: Alf or Alp Aur A, 13 Aur A, HR 1708*, Gl 194 A, Hip 24608, HD 34029, BD+45 1077, SAO 40186, FK5 193, LTT 11619, and ADS 3841 A. A double-lined spectroscopic binary, Star Aa appears to be slightly more massive and so more highly evolved and cooler than companion Star Ab. Both appear to be on their first ascent of the red-giant branch, having probably both evolved from A-type dwarf stars with only a small difference in mass. 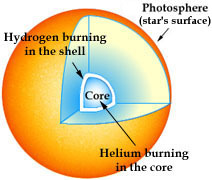 Star Aa has almost certainly begun the fusion of its internal helium into carbon (as a helium-burning "clump" giant), because its low surface lithium abundance is indicative of dilution by a fully convective, stellar envelope (Pilachowski and Sowell, 1992). However, the deeper, hot corona of Star Aa is much more variable than that of Star Ab. The extreme ultraviolet spectra of Stars Aa and Ab display the presence of iron emission lines from Fe XV to Fe XXIV (more). The two stars have a combined luminosity of over 150 times that of Sol. and creating an x-ray luminosity that is 10,000 times that of the Solar corona. According to Hummel et al (1994) in the new Sixth Catalog of Visual Orbits of Binary Stars, Stars Aa and Ab are separated by less than two-thirds (0.730) of an AU (68 million miles) and move with a circular orbit (e= 0.000) with a period of only 104.0 days and an orbital inclination of about 137.2° from the perspective of an observer on Earth. (See an animation of the planetary and potentially habitable zone orbits of the Capella Aab system, with a table of basic orbital and physical characteristics.) The two bright stars have another pair of dim stellar companions C and D at a current separation of about 11,000 AUs, or 0.17 light-years. Any Earth-type planets that may orbited Capella Aa or Ab during their youth probably have been burnt to a cinder. Currently, the water zones for either Capella Aa or Ab are farther out than the average orbital distance between these two stars. (As single stars, the orbit of an Earth-like planet with liquid water around Star Aa currently would be centered around 8.7 AU -- just inside the orbital distances of Saturn in the Solar System, while Star Ab's water zone orbit would be entered around 7.8 AU, between the orbital distances of Jupiter and Saturn.) 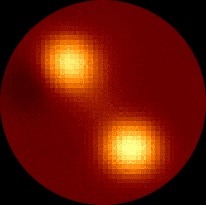 During the relatively brief, combined giant phases of the two stars at present, however, a planet could orbit the Aab pair far enough out for the two stars to act as a single gravitational source and near enough for it to receive enough energy to sustain life, possibly around 12.5 AUs out from the binary. Astronomers would find it very difficult to detect an Earth-type planet in the water zone of this binary using present methods. 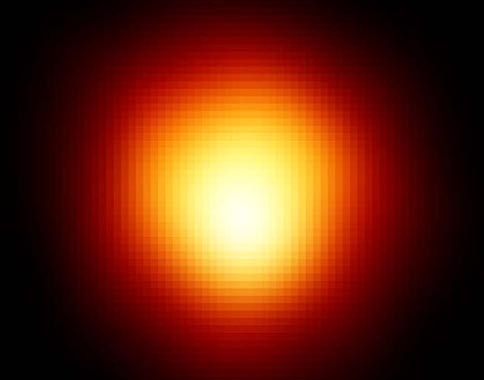 Discovered to be a faint companion of Stars Aab by Ragnar Furuhjelm, Capella C is a red dwarf star of spectral and luminosity type M1 V. It has about 30 to 40 percent of Sol's mass, 56 percent of its diameter, and 1.2 to 1.4 percent of its luminosity. Determined to be a binary by Carl L. Stearns in 1936, the combined visual luminosity of Stars C and D is about one percent of Sol's. According to Robert Burnham, Jr. (1931-93), this binary system was often designated as "Capella H" because the letters B through G were already used for faint field stars that are not gravitationally bound. The orbit of an Earth-like planet (with liquid water) around Star C would be centered around 0.11 AU -- well inside the orbit of Mercury in the Solar System -- with an orbital period of 24.4 days. Useful catalogue numbers and designations for the star include: Gl 195 A, G 96-29, LTT 11622, AC+45 217-363 A, and ADS 3841 H.
right of Gl 623 A (M2.5V). 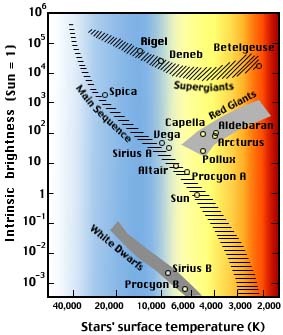 Capella D is a red dwarf star of spectral and luminosity type M4-5 V. It has about a tenth of Sol's mass, 25 to 30 percent of its diameter, and 0.05 percent of its luminosity. The orbit of an Earth-like planet (with liquid water) around Star C would be centered around 0.022 AU -- well inside the orbit of Mercury in the Solar System -- with an orbital period of 7.8 days. Useful catalogue numbers and designations for the star include: Capella L, Gl 195 B, AC+45 217-363 B, and ADS 3841 L.
The following table includes all star systems known to be located within 10 light-years (ly), plus more bright stars within 10 to 20 ly, of Capella. Try Professor Jim Kaler's Stars site for other information about Capella at the University of Illinois' Department of Astronomy. Up-to-date technical summaries on this star can be found at: the Astronomiches Rechen-Institut at Heidelberg's ARICNS for Star A, Star B, Star C, and Star D; and the Nearby Stars Database. Additional information may be available at Roger Wilcox's Internet Stellar Database. The Babylonians, Greeks, Arabs, and Chinese have all associated Constellation Auriga with a charioteer. According to one Greek myth, the head goddess Hera had a child who was born lame. Disgusted, she threw him out of Heaven to Earth, where he became the famous lame smith, Hephaestus, who fashioned beautiful ornaments and armor for the gods and who came to Orion's rescue after Orion had been blinded. Hephasetus invented the chariot to move around better despite his lameness. For more information about the stars and objects in this constellation and an illustration, go to Christine Kronberg's Auriga. For an illustration, see David Haworth's Auriga.